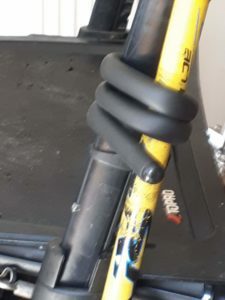 Recently a friend wrote to me talking about this wonderful thing she uses to secure her walking stick onto her mobility scooter. “Foolproof” she said. I thought I would test it out and I did not expect to be so impressed. In every sense of the word this is a flexible walking stick holder. It is a lightweight tube that can bend, fit and grip, perfect to keep walking sticks upright that are always ending up on the ground. I ordered the flexible walking stick holder on Amazon. It arrived the next day in an A4 sized envelope. I opened the envelope and tipped out the contents, two 45 cm long pieces of straight rubber tubing. “This looks fun” I thought to myself as I picked one up and bent it very easily. My Topro Rollator has got the cup for the bottom of the walking stick but I have lost the top bit that holds the stick in place. In a matter of 10 seconds I had moulded the flexible walking stick holder around the Rollator that would hold the stick in place. 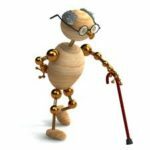 When my walking stick falls onto the floor I find it difficult to keep my balance when I bend over to pick it up. It is essential that I hold onto something secure and steady that takes my weight. The big advantage of the flexible walking stick holder is that I can use it in so many different ways to secure my stick safely. I can easily bend and twist the stick holder, reuse it and I’m sure I can even use it to fiddle with when I’m feeling nervous. it retains its shape and position and does not unravel. 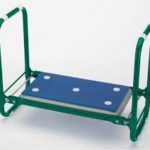 This flexible walking stick holder is easy to grip and mould into shape to prevent your walking stick falling to the ground and so keep it safe and available. I would like to buy them in a colour other than black. It’s so easy to lose something in black,what’s wrong with green or yellow or orange? This is an outstandingly useful item for people who have to use a walking stick. It is very good value for money especially as you get two so I’ve got a splendid opportunity to lose one. Maybe that’s why I don’t like them in black. 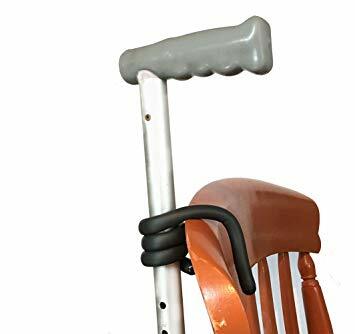 You can buy this Walking Stick Holder from Amazon or just click HERE or on the pictures. I am an Amazon affiliate. Can buy pack of 4 in black or yellow for £2.49 in Pounstrechers. Found in the DIY section called multi purpose cords by House & home. It is a big saving and yellow too! The flexible walking stick holder looks amazing! Thanks for the tip! I was made aware of it quite by chance. I think it is very useful.